I like amazake, sweet, slightly fermented rice drink. It has made a comeback in recent years because it’s highly nutritious. 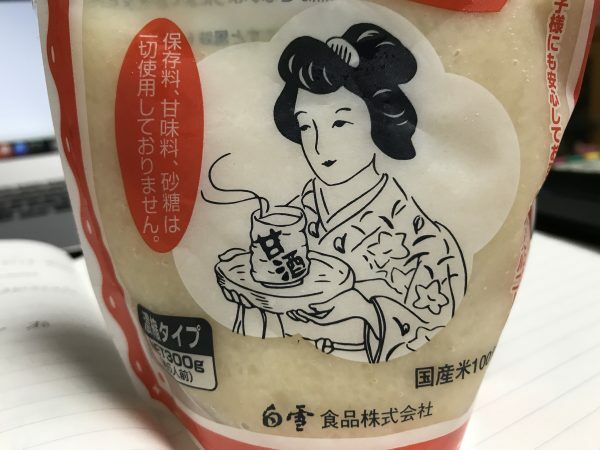 Some Japanese people even say that amazake is like a drinkable IV drip to give you energy. In Edo Period, people drank it in summer to prevent exhaustion from the summer heat. Let me introduce my latest favorite amazake recipe. First, I don’t make amazake by myself. I buy a pack of amazake. I like “Shirayuki amazake”, 300g, from Shirayuki Shokuhin. It costs 300 yen. I scoop 3 tablespoons of amazake to a dessert bowl, add 3 tablespoons of plain yogurt and mix them. You can add a little lemon juice if you like. That’s it! It is very easy and very tasty! It’s like a creamy ice cream. You should try it! It will help you revive yourself in this hot summer.